No toolkit would be complete without at least one Stanley Knife. It’s no secret that Stanley are renowned for their production of knives around the world (although sometimes referred to as box-cutters or utility knives), and that they are a staple feature of any tradesmen’s toolkit! Stanley have a reputation for being the best of the best when it comes to knife blades. Manufactured in the ‘Steel City’ of Sheffield – a sure indication that the steel used to manufacture said blades is going to be a cut above the rest – Stanley have built up an impressive product portfolio since their inception in 1843. 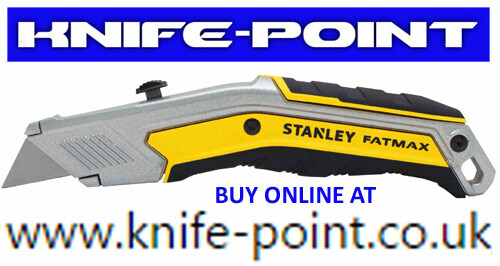 But with so many different varieties on the market, it can be difficult to pick the correct Stanley Knife for the job. 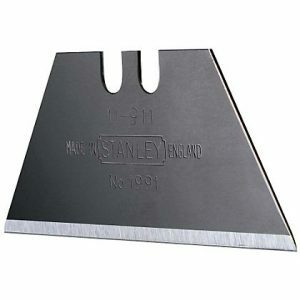 Let’s take a look at the most popular Stanley Knife blades and their applications. First up we have Carbide knife blades. These blades are made using Tungsten carbide, in a process where Tungsten Carbide powder is applied directly onto the blade itself. This then strengthens the already sturdy blade, providing additional durability and increasing the lifespan of the blade by several years. For people looking to cut stronger and harder materials, a Carbide knife blade may be the way to go. Just remember however, that it is only the cutting edge of the blade that has been coated, so the rest of the blade will flex as usual. Next up we have hooked knife blades. These are perhaps one of the more unique styles of Stanley Knife blades, and are designed with distinctive hooked edges; for a very good reason. Whereas standard Stanley utility blades could perhaps cut through more layers of material than you would have wanted, hooked knife blades are designed to allow the user to hook the blade edge over whichever end of the sheet you are looking to cut, and then quickly draw it backwards. This allows you to make a cut only in the one layer you are wanting to cut. For sheet material cutting such as plastic sheeting or floor coverings, hooked knife blades are the way to go! This knife blade is the real deal, as it is considered by the manufacturers to be the sharpest, the longest lasting, and the strongest Stanley knife blade currently on the market. FatMax blades can resist snapping against very heavy weights. Specifically, against weights of up to 35kg! These blades are generally more expensive, but, as they say ‘you get what you pay for’. The extra cost reflects the overall quality, and these blades really are in a league of their own. FatMax blades are perfect for anybody who uses a Stanley knife on a regular basis, and if you can afford to spend that little bit more on your blade, the extra investment will be well worth it.